The weather forecast says abundant sunshine. Snow melt has made puddle jumping the urban sport. People walk with open coats. And I spied my first sidewalk flower seller. She was near the intersection of Manas and Kievskaya, which is where I live. As I approached her, our eyes met, and I crossed sidewalk traffic to look at her offerings. Her flowers were bundled with torn strips of T-shirt, and she had named each of them. The purple and yellow flower bunch beside her head is the Ramon. It is Spanish, she said. The one below her chin is the Carmen. But they are not just flowers, she said, they are soul. All of this in Russian, and all of it I understood (or believe I’ve understood, which may be the same proposition). I asked her about each flower bunch just to keep standing there and being in that moment, and she said lots of things I didn’t get. I kept smiling at her and looking at her and listening to a tumble of words in the late afternoon light with long shadows and promises of spring and all that comes after that. I fell in love with her and went wiggly with gratitude for this chance to be here and for this maybe of being understood and for all that comes after that. I bought the Ramon. It is in a simple vase on a pile of journalism books beside my TV. 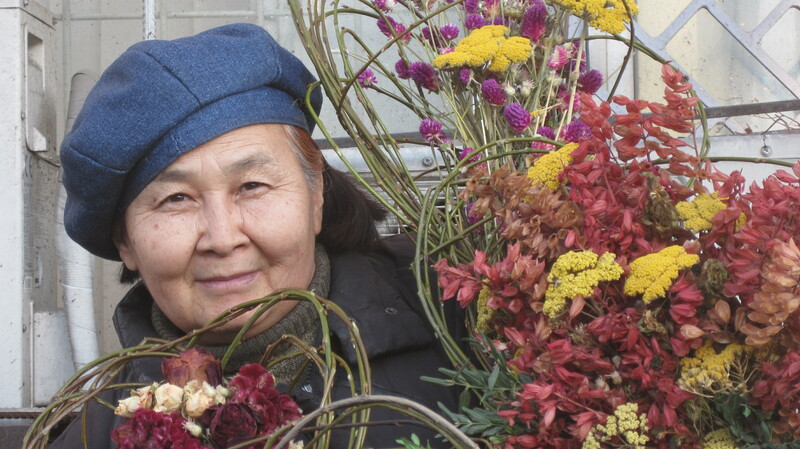 I saw that woman once, and I thought the bouquets she was selling were the most beautiful I have ever seen, because they were so organically arranged, so harmonious and so warm. I am very glad you ran into her and told about this.